Paint is a funny thing. When it’s done well, it’s one of the easiest things in the world to ignore. But when it’s done poorly, or when it’s in need of some serious updating, it makes even the nicest buildings look unsightly, old, and ugly. We know how tempting it can be to want to finish a paint job quickly, which can lead to improper prep work and ultimately, shortened paint longevity. Our paint team at FS Construction Services understands exactly what a good paint job can do, which is why we take great pride in making sure every paint project we complete is handled with the greatest care and attention to detail. The first key to a print project that stands the test of time is ensuring prep work is done properly. Our prep work involves scraping existing paint, power washing, using a cleaner like TSP or chalk remover, and applying a primer. We’ve always believed that primer is the key, not only providing adhesion for the top coat, but providing overall protection for your building. We know how easy a great paint job is to overlook. We also know just how much of a difference it can make when it’s done well, especially in ways that can’t be seen. This leads us to the second key factor to ensuring your paint project looks great for years to come, a team of experienced professionals with a dedication to detail and quality. Over the past year, our paint team has been hard at work on the 60+ projects. From sheds to grain bins to roofs to trim to entire homes and buildings, we have had great support and feedback from the communities we serve. We appreciate your trust and know none of this happens without you. Brian “Boomer” Garleb and the team of paint professionals are thankful to all of you who have trusted your special projects to our team over the years. 2018 was a great year and are looking forward to the many opportunities and challenges 2019 will bring. So, if you have outdoor structures that could use a touch up, whether they are residential, commercial, or agricultural, please let Gateway FS Construction Services know. Give us a call at 866-551-3454, and let our specialists provide you with a free estimate and help you achieve the fresh new look your project deserves. We look forward to providing you the best customer service experience. At FS Construction Services, we have the benefit of working with a number of great partners who manufacture trustworthy, state-of-the-art equipment and material. But a successfully-completed job means much more to us than simply providing the raw material. We want to give each of clients the tools necessary to use that material to its greatest potential, ensuring they always get their money’s worth. 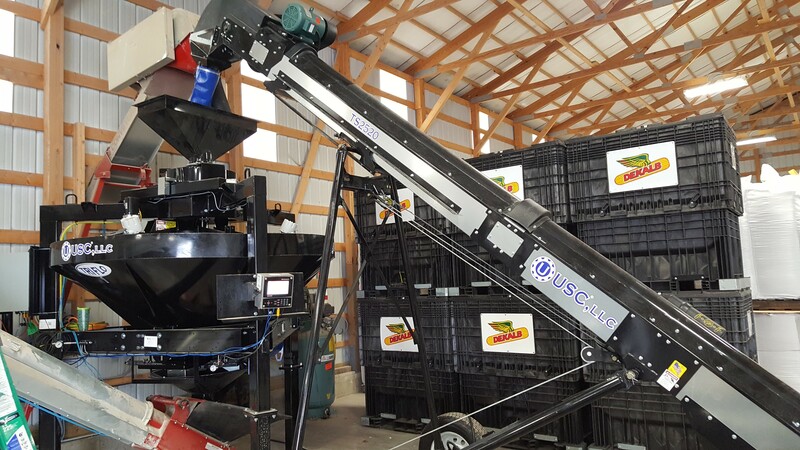 Over a couple of weeks this year, our Seed Treating Solutions Specialist Justen Kempfer installed a brand-new USC Tri-Flo Continuous Scale for a client. Thanks to its continuous flow mechanism, this new system significantly reduces the amount of time it takes to treat seed from bulk bins because it doesn’t have to wait for an entire weight of seed to enter the batch hopper. However, because we wanted to make sure that our client was comfortable with the brand-new equipment, we provided extensive training and support after installation. Justen and FSCS Technician Kenny Huebner even designed a system that integrated three different automation packages from two different manufacturers to ensure our client would always have a fast, accurate treating system. With the constant changing and updating of technology, it’s important to us that we give our clients the tools necessary to get the most from their equipment. From the beginning of an idea to the end of its implementation, we want our customers to not only have the best possible experience, but to be fully equipped to succeed in their endeavors. If you are in the market for seed treating equipment, or you have questions about how to use, upgrade, or interface with your equipment, you can let Gateway FS Construction Services know. You can give us a call at 866-551-3454, and let our specialists help you find exactly what you are looking for. We look forward to providing you the best customer service experience. We hope that all of our friends and customers are enjoying some much-deserved holiday rest right now. Of course, as we approach the end of this year, it’s impossible not to think about the year to come, with all of the projects and work that will be started or finished. 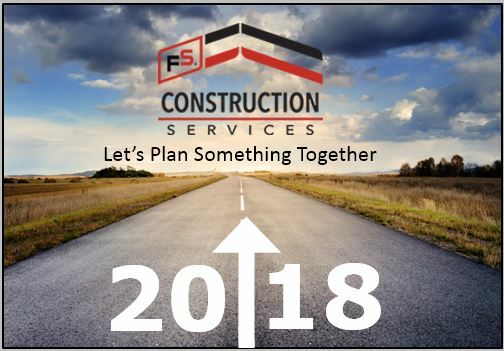 When it comes to getting stuff done, whether it’s around the farm, office, or home, FS Construction Services has the experienced staff, expertise and resources to help you with your 2018 projects. Plus, the area’s most skilled and detail oriented crews. With the right tools, over 40 years of construction service, and trusted partners, we are looking forward to the many projects we will get to work on in 2018, and even more than that, we are looking forward to the new clients we will get to meet. So as you think about the year to come, if you have any questions about the sorts of projects we can help you with, let Gateway FS Construction Services know, you can give us a call at 866-551-3454, and let our specialists help you find exactly what you are looking for. We look forward to providing you the best customer service experience. 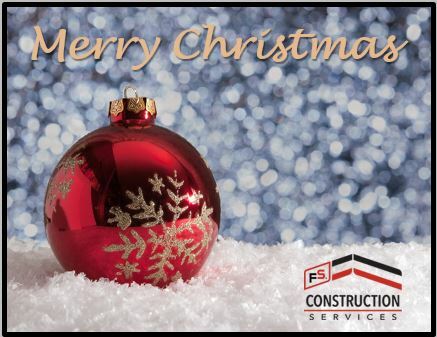 As 2017 winds down, we here at FS Construction Services wanted to take a moment to wish all of our customers, clients, and friends Happy Holidays. It has been a great year full of exciting projects, new developments, and more importantly, getting the privilege of working with our friends and neighbors. Though the holidays can often be a hectic time, we hope that you are able to get some rest and enjoy the company of family and friends. Whether you are sticking around home or traveling, we wish you a safe and merry holiday season. We are so grateful for all of our clients and customers and we want you to know how much we enjoyed getting to work with you this past year. We thank you for your support and hope you will continue to work with us in the future. Here’s to a Merry Christmas, Happy New Year and great 2018! Of course, if you have any questions or even some last-minute work you would like to get done before the new year, don’t hesitate to let Gateway FS Construction Services know how we can help. If you have any questions, you can always give us a call at 866-551-3454, and let our specialists help you find exactly what you are looking for. We look forward to providing you the best customer service experience. There are a number of investments homeowners can make to improve the quality and value of their home, but few of them are as crucial as choosing the right roof when the time comes. The number of issues that stem from an old or poorly-installed roof are endless. Conversely, a high-quality, expertly-installed roof provides lasting piece of mind. Or at least, lasting about 12-20 years when considering a traditional asphalt roof. A metal roof, on the other hand, can last anywhere from 40-70 years, significantly longer than a standard roof. Additionally, metal roofs are better able to seal out water, air, shed snow, and stand up to high winds without damage. 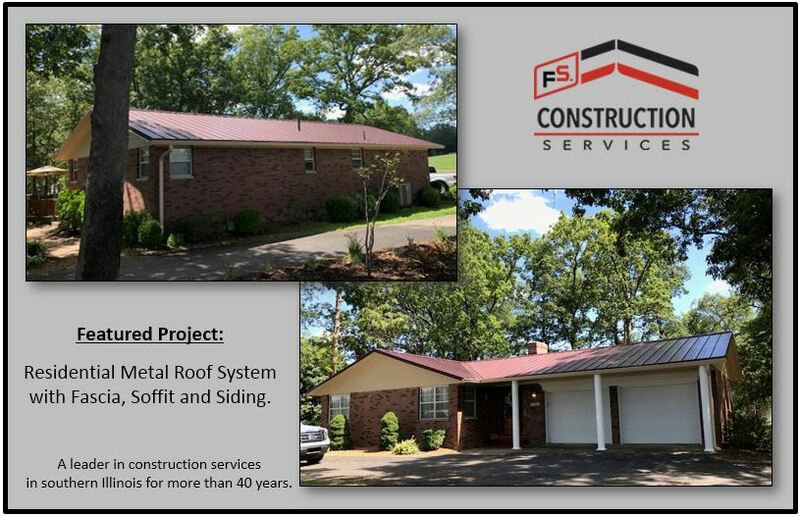 This past summer at FS Construction Services, a client of ours made the decision to switch to a metal roof, and ensured they won’t have to worry about their roof for a long, long time to come. In June of 2017, our building and construction expert Tom Marcheski and his team came and removed the existing shingles, fascia, soffits, and siding from the client’s home. We replaced the old roof with Fabral’s Horizon S Series 26-guage roofing panels in the specific color that complimented the beautiful exterior of the home. This brand-new roof, featuring concealed fasteners, will provide our client with decades of protection and harsh-weather resistance. To top it off, we also removed the house’s old gutters and replaced them with 6” seamless gutters, complete with a Leaf Terminator leaf guard system. Does your home need more than a new roof? Did you know the professionals at FS Construction Services can help there too? Our staff of experts can also help with other home repair and maintenance needs that range from simple and routine to paint, electrical and more. Contact us today to find out how we can help. If you’re in the market for a new roof or are interested in learning more about the advantages of a metal roof, be sure to let Gateway FS Construction Services know how we can help. Not only do we work on residential roofs, but we also work on commercial and agricultural roofs. If you have any questions, you can always give us a call at 866-551-3454, and let our specialists help you find exactly what you are looking for. We look forward to providing you the best customer service experience. For most people, a garage door isn’t something you think about much until it stops working. However, at FS Construction Services, we know that a little bit of thought about the type of garage door you have can go a long way. This past summer, Tom Marcheski, our Building and Construction expert, oversaw the installation of three, high-quality garage doors on a newly built house. And as this project shows, there is much more to a garage door than what it looks like and how fast it goes up. Our partnership with Raynor Garage Doors gives us access to some of the nicest, best-looking, and most dependable garage doors on the market. For this particular project, we installed three Aspen 138 Series doors and three 1/2HP belt drive operators. These 9’ x 8’ doors are designed not just with longevity in mind, but ultimate comfort and home efficiency as well. Thanks to Neufoam polyurethane insulation blown between the steel skins of each door, expanding to fill 100% of the space, the Apsen 138 doors have an R-value of 13. This excellent insulation will help keep your garage, and all that’s in your garage, warmer in the winter and cooler in the summer. Additionally, the A138 doors feature a WeatherLock section joint that prevents air and water from getting into the interior of the garage. Meanwhile the heavy-gauge steel used for the door tracks is made specifically to order, so your door will fit perfectly over its long life. While all of the above is hugely important, it is also important that these garage doors look as good as they function. Luckily for this project, Raynor recently introduced their new Walnut Wood Finish style that fit perfectly with the surrounding house. So our client will be able to enjoy great looking, great operating garage doors for many years to come. 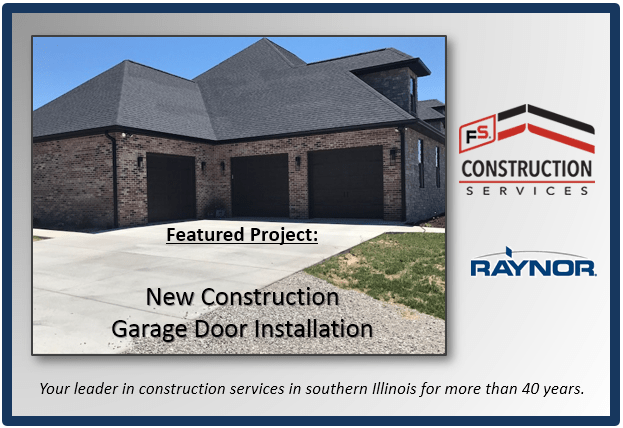 FS Construction Services performs installation and maintenance on both residential and commercial garage doors, as well as a variety of other types of maintenance for residential and commercial buildings. If you have garage door needs, or any other building or maintenance need, be sure to let Gateway FS Construction Services know. If you have any questions, you can always give us a call at 866-551-3454, and let our specialists help you find exactly what you are looking for. We look forward to providing you the best customer service experience. At FS Construction Services, we’ve talked before about the benefits of imagination when it comes to buildings, and that’s why it’s important for us not to limit ourselves or our clients when it comes to specialty and custom projects. At the beginning of this year we had the privilege of building a wood building just a little bit out of the ordinary. Our partnership with Walters Buildings has allowed us to construct many high-quality wood buildings over the years. 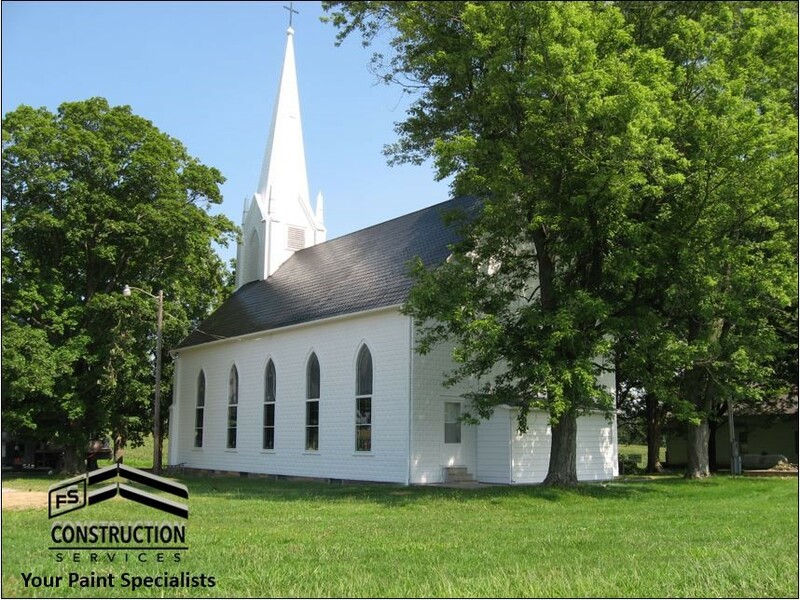 Often those buildings are used as storage sheds, activity centers, churches, or other community or commercial-type buildings. 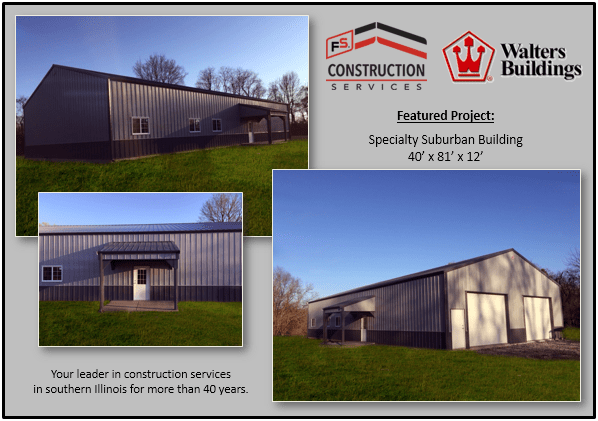 In this particular case though, Tom Marcheski, our pre-engineered buildings expert, oversaw the construction of a 40’ x 81’ x 12’ wood building that, while typical looking on the outside, was anything but on the inside. Rather than open storage space or a community meeting center, inside this building is a fully function living space. This living space features three bedrooms, two bathrooms, and is completely framed out and dry walled. The building also has concrete floors, a porch, and the living area is separated from the garage by a cross-partition wall. The Raynor ShowCase garage doors are made of heavily-insulated steel and have an R-Value of 10.25, making for extremely effective thermal protection. Where many see a pre-engineered wood building as a place to store boats, cars, or agricultural equipment, our client saw it as an opportunity not just for storage, but as a complete living space. And our planning and building professionals brought the customer’s imagination to life in this incredibly spacious and functional specialty building. If you have an idea for a wood building, be sure to let Gateway FS Construction Services know how we can help make that a reality. Or, if you are in the market for a steel building, check out Butler Manufacturing’s current free-shipping deal on their Classic II building (when ordered by 12/1/17!). If you have any questions, you can always give us a call at 866-551-3454, and let our specialists help you find exactly what you are looking for. We look forward to providing you the best customer service experience. 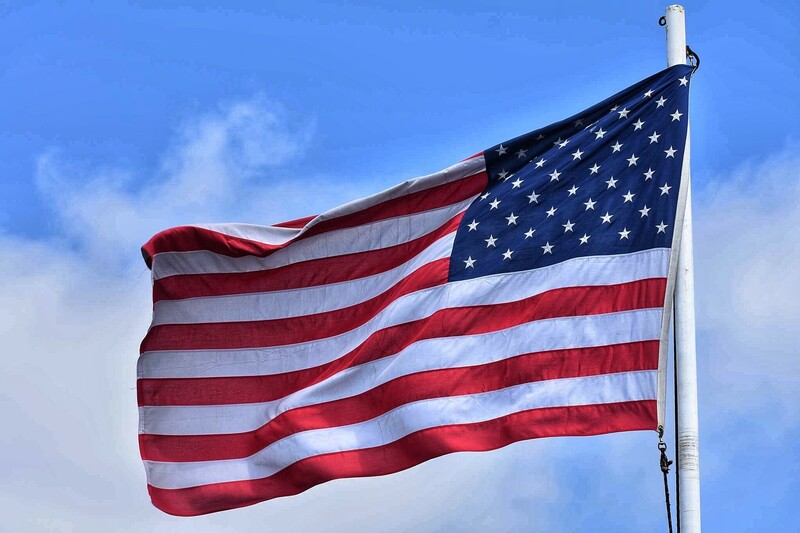 Here at FS Construction Services, we wanted to take a short break from talking about grain bins, steel buildings, and seed treatment, to highlight one of the most important days this month: November 11, Veterans Day. To all of our friends, family, neighbors, and clients who serve or have served in the U.S. Armed Forces, we would like to say thank you. We are able to do the work we love in and for the communities we live in because of your incredible sacrifice and dedication. This year, we wanted to make sure everyone gave some time and attention to the brave men and women who serve and have served our country over the years. Veterans Day began as “Armistice Day” in 1919, after the end of World War I, and while there are countless books that could be written about the U.S. Armed Forces, we thought we would share a quick video we came across that puts in perspective just how many men and women have served our country over its history and how many are still serving it today. It’s hard to express just how deep our gratitude is for those who have served our country. It is thanks to your work that we are able to enjoy such freedom and safety. So from all the folks at Gateway FS Construction Services: thank you. If you are interested in participating in or observing any Veterans Day events, be sure to check with your local VFW. Harvest is a season of being stretched, stretched for time when you’re working early mornings and late nights, and stretched for space when you’re filling your bins to capacity. And sometimes, both time and space can run low simultaneously, making for a particularly stressful harvest. Luckily, at FS Construction Services, we have experts who are able to work on all manner of projects, big or small, no matter the time crunch they’re facing. This past August, our Grain Systems expert Nathan Koester oversaw the construction of a new Sukup grain bin for a client who needed it as soon as possible. 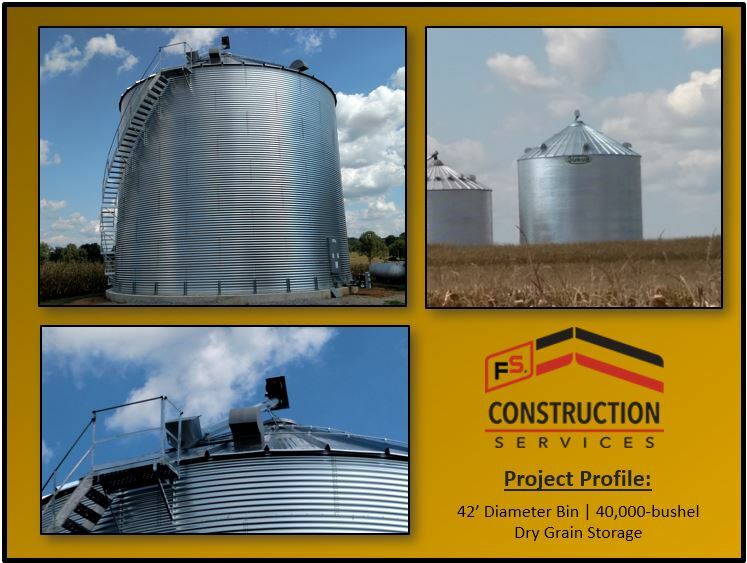 Over the span of 10 days, FS Construction Services built a 48 ft. diameter, 7-ring tall bin with a capacity of 40,000 bushels. Additionally, we added wrap-around stairs for easy roof access, an OPI temp/moisture cable system, a gravity spreader, an 8” power sweep, and a dual centrifugal fan with an ultralow temp burner for low temp drying. Completed on August 20th, this project was finished just in time for our client to make full use of the new space and new equipment. 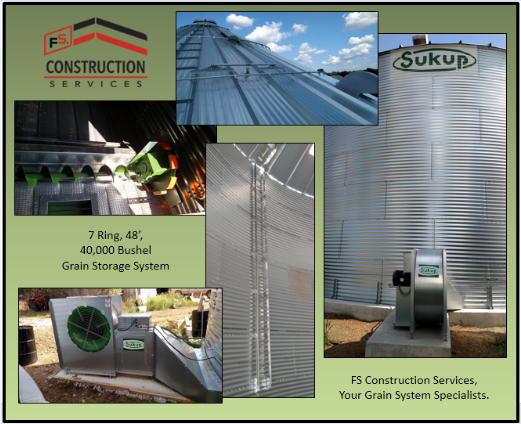 Sukup’s grain bin and grain drying technology makes it easier than ever to produce evenly dried, safely stored grain, which is one of the many reasons we have enjoyed a partnership with them for so long. If you are looking for new equipment or accessories for grain drying, grain storage, or grain handling and transfer, let Gateway FS Construction Services know. We work with a number of trusted partners and employ the best in the business. You can give us a call at 866-551-3454, and let our specialists help you find exactly what you are looking for. We look forward to providing you the best customer service experience.